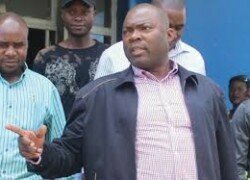 COPPERBELT Minister Bowman Lusambo has cautioned civil servants in the province to stop engaging in partisan politics especially now that the election period is over. Mr Lusambo said President Edgar Lungu was in a hurry to develop the country, and warned that any civil servant found frustrating development efforts would be disciplined. Speaking when he officiated at the 2016 Lesa Nkushe traditional ceremony of Chieftainess Lesa of Bulimia of the Lamba-speaking people in Mpongwe district over the weekend, Mr Lusambo said the PF government remained committed to fostering unity and peace across the country. Government would always rely on the knowledge and wisdom of traditional leaders in governing the country in a bid to sustain the peace and tranquility that the country has enjoyed since independence. He said the PF government attached great importance to traditional ceremonies because it was through them that the country’s cultural identities were drawn as they played a critical role in preserving and transmitting culture to the young generation. “As Government, we remain resolute to fostering unity and peace across the country. We are one people and thus politics should not in any way divide us. The ‘One Zambia, One nation’ motto will most certainly remain our national heritage and we must cherish it,’’ he said. He added that Zambia was a Christian nation governed by Christian values and this could be observed from the peace and tranquility experienced during the just ended 2016 general elections. Mr Lusambo was glad that the country had once again embraced the spirit of unity and love for one another despite different political affiliations, saying Zambians should not allow politics to divide them. Mr. Lusambo, who is Kabushi PF Member of Parliament, said civil servants should realise that their allegiance was to President Lungu and the government of the day. “We are aware that some of you supported different political parties in the just ended elections and now it is time to work. Avoid engaging in partisan politics and focus on delivering to the expectations of Government,” Mr. Lusambo said. And speaking on behalf of all the Lamba chiefs, Senior Chief Chiwala disclosed that the traditional leadership in the province had welcomed the appointment of Mr. Lusambo as provincial minister. Senior Chief Chiwala commended President Lungu for appointing Mr. Lusambo whom the chiefs considered to be their own son since he hailed from Lamba land. The traditional leader said the royal highnesses in the province were looking forward to a cordial working relationship with Mr. Lusambo. Senior Chief Chiwala said the traditional leaders were confident that Mr. Lusambo would deliver to the expectations of the royal highnesses and the people of the Copperbelt. The Lesa Nkushe traditional ceremony of Bulima people of Chieftainess Lesa of Mpongwe district is held annually to depict the people’s experience during their migration from the Luba-Lunda kingdom of Kola in Congo DR.